CNN Senior Political Analyst Ron Brownstein on SCOTUS health care decision and Chief Justice Roberts as deciding vote. He talks to Kate Bolduan with the details. Associate Professor of John Jay College Gloria Browne-Marshall on how civil action could be next step to get documents. She talks to CNN's Kate Bolduan. Watch the interview and tell us what you think. CNN's Jeffrey Toobin and David Gergen break down today's Supreme Court decision on health care with John King. Tell us what you think of their analysis. Fmr. Obama Domestic Policy Adv. Melody Barnes & Romney Health Care Policy Adv. Tevi Troy get inside today's health care ruling. Watch John King's interview and tell is what you think about the final decision. Reps. Chaffetz & Quigley tell John King that Congress must follow-up on missing documents in Fast & Furious investigation. What do you think of Attorney General Eric Holder's contempt vote? Republican Latinos want more from Romney on immigration. John King and Ana Navarro discuss Mitt Romney's comments on immigration and how that's playing with Latino Republicans. She thinks Latinos deserve a clearer answer. John King and Nicholas Burns, former U.S. Ambassador to NATO, talk about NATO, Syria and Turkey. John King and Soner Cagaptay, a Senior Fellow in the Washington Institute for Near East Policy, discuss Syria-Turkey relations now that Syria has shot down a 2nd Turkish plane and Turkey has asked NATO to get involved. John King and Gov. 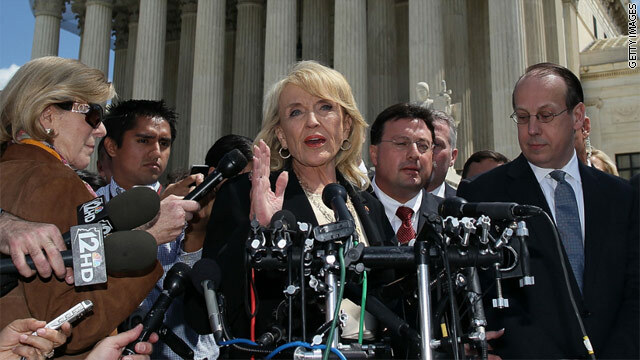 Jan Brewer, (R) Arizona, talk about the Supreme Court's decision to strike down some of the provision's in her state's controversial immigration law. The U.S. Supreme Court ruled on Arizona’s controversial immigration law SB 1070 today, giving the federal government “significant power” to regulate borders, but allowing local law enforcement to check people’s immigration status while enforcing other laws. Although the court’s decision gives the federal government the authority to block most parts of SB 1070, Arizona’s Governor Jan Brewer said “the heart” of the bill can still be implemented. Gov. Brewer will join us live tonight at 6pm ET/5pm CT on "John King, USA" to discuss the ruling and what’s next for Arizona.